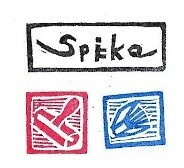 printbookspike | Some Prints, Some Books, Some Art, Some Words. printbookspike – Some Prints, Some Books, Some Art, Some Words. Some Prints, Some Books, Some Art, Some Words. Any one reading this blog will know I love Lino printing and making hand-made sketch books. ( among many other things). I also love collecting a few things along my life journey that inspire me to create. ( mainly nick knacks with an interesting design). Also, as I have a fascination with history, I collect things that have, at one time, been useful in day-to-day work but are now discarded as the world has become a very disposable place to live. This includes useful objects humans have invented/created; typewriters,pocket radios & old office bits and pieces just to name a few. I love books, I have a few. I love typewriters, I have a few. ( I like to think of it is as type of printmaking in a way). I also collect old garden tools. I don’t know why but I just like them.Each tool was made for a purpose and they too were used to create/grow something from nothing.like art, they have on them blood sweat & tears. So as a way to show my love of both why not join the two. So I’ve started my own collectable card series. Collectable cards are usually of sport stars, Football, or Basketball for example but I thought I would make my cards of some thing actually useful. Well, it is half way through Winter now and there’s a nip in the air. The days are cold and the sweet scents that drift along on a nice warm breeze have gone. I miss the smells of the flowers, the bushes & even the trees. ( I have a very good sense of smell ). I even miss the smell of some of the manures I use in the vegetable garden. There is one spot on the way home from work, on the northern side of Kings Ave. Bridge, Canberra, where the sun hits a long stretch of juniper bushes and the smell, when driving past drifts into the car. Lovely. There are signs that spring is on its way. I saw a bird yesterday flying with a small stick in its mouth, though not very straight, towards a nest I suppose it was building.Some trees & bushes buds are starting to swell and our Daphne is about to flower. Ah!,Spring will be here soon enough and gardening will resume. our garden is on the wrong side of the house for winter crops. Yes, I’m dreaming of warmer days to come. Well, It’s that time of year again. When most people are starting to wind down & relax for the up coming break. Being a Postal worker this is our busiest time of the year. let me quote Newman from the TV show Seinfeld, “Because the mail never stops. It just keeps coming and coming and coming. There’s never a letup, It’s relentless. Every day it piles up more and more, but the more you get out, the more it keeps coming. And then the bar code reader breaks. And then it’s Publisher’s Clearinghouse day.Jerry: All right, all right.”. Extra long work days,crappy shopping malls with no parking,full of people without good manners, and being the southern hemisphere usually hot nights for sleeping all add up to not a fun time for us. I’m always glad when it is all over. But one thing I enjoy and try to make time for, is to print a Christmas card for friends & family. Ever since I fell in love with printmaking I’ve tried to print a Xmas card every year. Here Is a selection of cards so far. One other thing I like at work at Christmas, and this might sound strange, is the sight of green glitter usually around our mail sorting machines, that has fallen off peoples hand written letters. It always reminds me of when I was a kid and glitter was special ( & a little bit magical!). Wishing you all a Merry Christmas & a Happy New Year.Take care & thanks for reading my blog. When I was younger, one place my mates and I would hang out in summer was at the Olympic Pool in Civic. The pool was in the middle of Canberra and we would either catch a bus or ride our bikes there.On a hot summer’s day it was great. Go on – Dare yah! While the lower spring diving boards were great fun to me, I never had the guts to jump off the 10 metre board at the very top. ( I did venture up there once for a look but soon retreated back down the ladder to fight another day). The Five metre board half way up was the limit of my bravery. But many good days were had any how. I thought I’d do a small Linocut print of it. As being on prime real estate in the middle of town, it’s days are numbered. Another Linocut print I did a few years ago now, depicts our local football/cricket oval. We did hang out there a lot too, always playing whatever sport of the season was. There was always a crossover in spring & autumn so we could still be playing cricket when it was a bit colder and footy when it was warming up. When hanging out with your mates it didn’t matter. It was always great fun. I am often inspired by urban life and the jobs done by ordinary people. “The Trolley Boy” was done after sitting in my car one day while waiting for my wife, at the local shops.As one of the young blokes collected shopping trolleys, I wondered how long this job would be required into the future. Not far from this spot Is the where the idea came for “No Junk”. In the same car park , these charity bins were once located. Everyone would have to pass them whenever going to the shops.They would always look like a mini rubbish dump.The amount of junk piling up around these was always an issue and nothing much was ever done to alleviate the problem.In the end they just moved the bins to another location. At the moment I am working on a special book project,(mainly for myself, but I will share later on when I finish it). If anyone is interested I also have Instagram & Facebook pages. (printbookspike) for both. Till next time, take care, spike. I have been making some pocket sketch books lately so i thought I’d let you see some of those.As well as some of my previous book projects. The vans book was from a shoe box. the green book is from a boost juice cup. When making some of my books, I try to recycle any thing of interest. Its always good fun & I’m always happy with the final book. thanks for your time, spike.